If you are new to particle characterisation the terms and descriptions can seem a bit alien. Here is a quick description of the various methods Meritics has; with a little bit of history thrown in. The effect of particles on a final property has been known for a long time, and the methods for particle measurement have developed accordingly. There is evidence that the ancient Egyptians used sieves to separate precious metal ores circa 4000 B.C. A great many industrial processes involve small particles. These particles may be solid such as silica or sand, a liquid such as oil droplets or emulsions, or may be suspended in air e.g. smoke or dust emissions. The size range of such particles is usually large, at least 10 to 1 and often 100 or even 1000 to one, or more by diameter. Because the size range is so vast, and because historically it has been convenient, the size of the particles is expressed by diameter and rarely by volume as in cell biology. Chemically the range of composition of particles is very extensive as are the uses to which they are put. Powdered plastics may be used to coat metals to replace paints which have expensive solvents, or to make false teeth. A hot topic at the moment is the use of Microbeads in cosmetics such as facial washes. Particles in smooth foodstuffs like chocolate should be small so that they do not taste gritty (sugar particles below 10µm), but not too small as to affect viscosity and flow conditions. In cosmetics, protective toothpaste such as “enamel care” need to contain particles fine enough to remove stains but not so large as to damage the tooth further, in comparison “whitening” or “smokers” toothpastes have a high abrasive mixture. The tomato cells in ketchup should be of an appropriate size to give a good natural colour to the product (about 20-25µm). Drugs should be reduced to a size to give the correct rate of absorption into the body (usually below 35µm). An intravenous saline solution should be free of foreign particles down to around 2µm, as far as possible. Dust in mines and quarries should not be in the hazardous 2-5µm size range, as silicosis or other occupational diseases may occur. Diesel emissions need to be controlled and captured to prevent inhalation and health problems. Insecticide sprays should have a maximum coverage area, with small droplet sizes, but not too small to drift or be blown off the area being sprayed. Particles in grinding pastes and polishes should be of similar size to avoid scratching. The size distribution of rocket propellants and explosives control their efficiency. Sedimentation is an obvious process, the larger or denser the particle, the faster they fall in air or liquid. In 1850 Sir G.G Stokes used this effect with known sized solid spheres to measure viscosity on a liquid. Using this principle; where size is unknown but viscosity is known; it became a version of Stokes Law familiar to particle technologists. It’s worth noting that Stokes Law was developed for a large number of variously sized, very small particles of non-spherical shape, but it can usually be applied with relative success to particles in the overall range of 2-100um diameter, or smaller if applied to a centrifugally separated suspension. Stokes Law does not measure particle size but the rate of fall of particles from a suspension. A more direct method derives from Van Leeuwenhoek, the first scientist to use a microscope seriously. 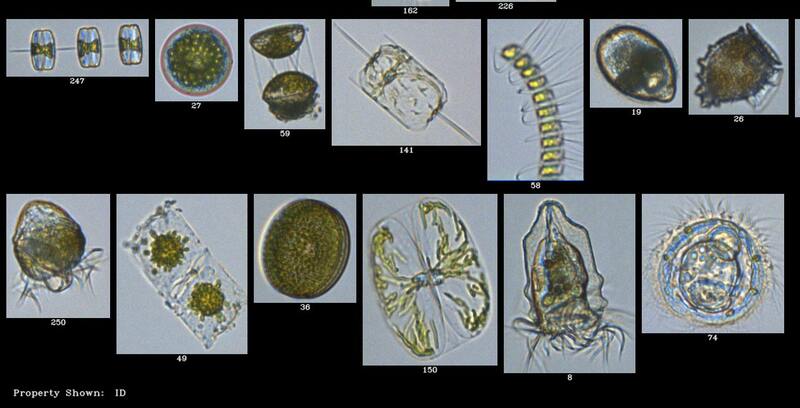 Today microscopic examination and counting and sizing of small particles is commonplace, Meritics work with Fluid Imaging Technologies (FIT) and their FlowCam Image Analyser range can size from 300nm to 5mm in range, this takes the tedium involved away and frees up the scientist to analyse data comprehensively. Manual microscopy is slow for particle sizing and counting, and in the late 1940’s an entirely new approach was made by Wallace H Coulter. By the Mid 1950’s he had perfected a device for counting small particles, one by one at a rate of up to 5,000 per second, each particle being sized individually by its volume to extraordinary accuracy of within a few percents, almost independently of particle shape. The idea ‘The Coulter Principle’ was basically so simple and effective that it led to Wallace receiving the coveted John Scott Award, in 1960, for scientific achievement, alongside such inventors as Madame Curie, Thomas Edison, Orville Wright and Guglielmo Marconi. 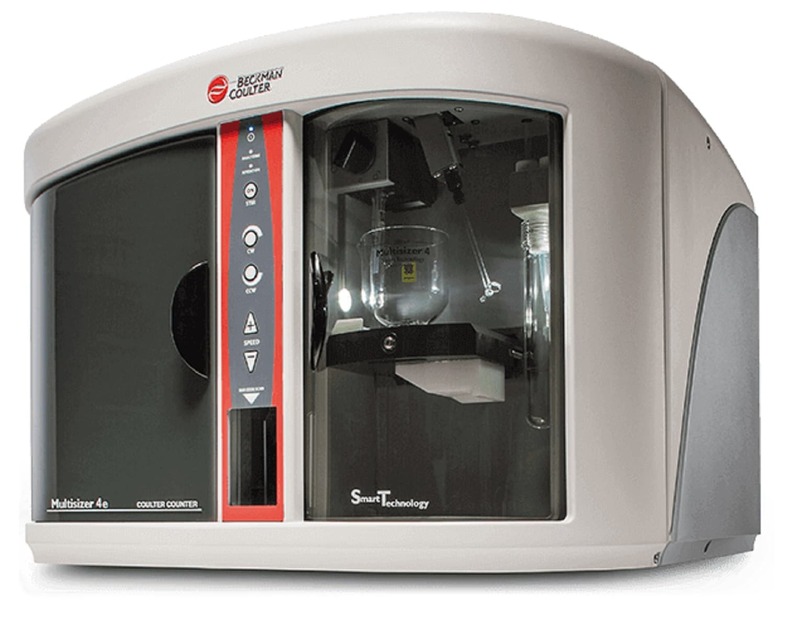 Wallace’s Model A Coulter Counter has evolved into today’s Beckman Coulter Multisizer 4e, with a range of 0.2µm to 1600µm and is widely used in many areas: Life Sciences such stem cells, cell biology, and Industrial such as toner, ceramics, sediments etc. as well as Pharmaceutical applications. The Multisizer 4e is available from Meritics Ltd in the UK. 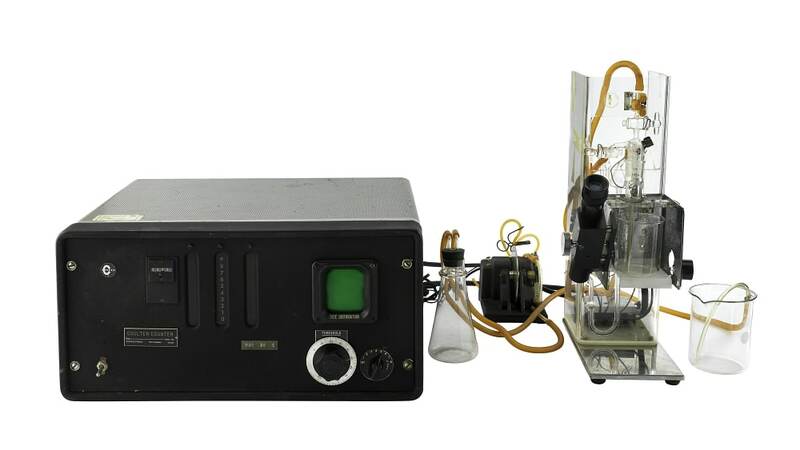 Today, the Coulter Principle (also known as ESZ – Electro Sensing Zone) is hailed as probably the most significant advance in the field of particle technology, and tens of thousands of Coulter Counter instruments are in regular use worldwide. The Spectradyne NCs1 has taken the Coulter Counter method and re-engineered the principle, it is now possible to count and size individual particles down to 50nm. Laser diffraction analysis is based on the Fraunhofer diffraction theory. The intensity of light scattered by a particle is directly proportional to the particle size. The angle of the laser beam and particle size have an inversely proportional relationship, where the laser beam angle increases as particle size decreases and vice versa. The particles are placed in a flow cell between the laser and its focal point. The material is analysed using its laser scatter pattern. The sizes the laser can analyse depend on the lens’ focal length. A single wavelength laser will not be able to size material less than 0.4µm. However, once the size gets below 1µm, there is little or any discernible shape to the intensity ‘curve’ making the discernment of any angular variation virtually impossible below approx. 0.4µm. Some manufacturers take the intensity data down to this size level and then make effectively; an educated guess; at the data below in order to show something down to 0.1µm. Beckman Coulter developed a patented detection system ‘Polarisation Intensity Differential Scattering’ (PIDS) to overcome the limitations of laser diffraction in this region. Particles scatter polarised light by differing amounts. By combining vertically and horizontally polarised light with multi-wavelength measurements, a much more accurate and reliable measurement can be made below 0.4µm. The approach has been validated by many of the other manufacturers trying to partially copy this by adding additional wavelength measurements. The most Modern Beckman Coulter LS 13320 XR system can now produce real data down to 10nm using the Patented PIDS system. For submicron particles, the principle of Brownian Motion can be used, as in the Beckman Coulter DelsaMax. Particles suspended in a liquid are in a constant state of random movement or vibration due to the molecular bombardment. The smaller the particle, the faster it will be vibrated. Analysis of the frequency change of scattered laser light pattern is made by auto-correlation spectroscopy, from which average particle size and particle distribution are calculated, the only contestants with this method are the liquids refractive index and viscosity or temperature need to be known. DLS has an overall effective size range of 3µm to 3nm. Other properties of particulate systems can be measured apart from size. The total surface area of a powder or porous solid can be estimated by absorbing a known amount of gas molecules onto the surface. Meritics have two instruments that use the BET (Brunauer–Emmett–Teller) method. 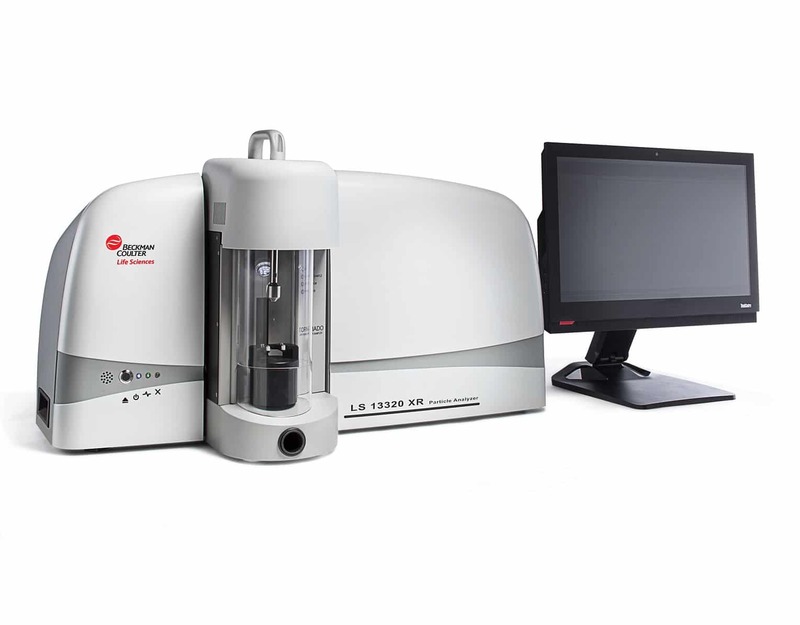 The Horiba 9600 Surface Area Series or the Thermo Scientific Surfer. For through-pore materials, such as filters, a fluid (normally Fluorinert FC-43) expulsion method may be used, where a wetting fluid is forced under pressure through a material and the sudden drop in pressure gives the bubble-point of pore-size. Meritics have a variety of Capillary Flow Porometers by PMI Inc. Most finely divided particles, whether suspended in liquid or air, carry a small electrical charge. In liquids, the amount of surface charge affects the rate of agglomeration (joining of particles together) of a suspension, and a high zeta potential (an effect of surface charge) gives stable single particle dispersion. Meritics supply the Beckman Coulter DelsaMax Pro to study the process. In powders, a high electrostatic charge can cause flocculation or dry-binding of the particles. Leading to powder-flow problems in production facilities for instance from the hopper (storage tank) or at a consumer level when trying to get a product out of a bag or container. Powder behaviour is an interesting subject and can be explored using our Mercury Scientific range. As far as particles characterisation goes, Meritics has staff experienced in almost all areas and can offer the most suitable equipment for almost any purpose. Please look out for a more comprehensive explanation on how each technique works over the coming weeks.